How Much Should You Give Your Kids for Allowance? Chances are that you want to provide your children with opportunities to learn about responsible money management. As a parent, I want to make sure my son understands the importance of making good choices, and that he gets off to a good start with good money habits. The most important item to consider is age. You want to provide an allowance that matches with the ages of your children. My son only received a dollar a week when he was five years old. Now that he’s 11, he receives a higher allowance. He also has a wider variety of things he can do to earn more money. Allowance should increase with age, and then, at some point, you start decreasing it. If you expect your child to get a job while he or she is in high school, it makes sense to reduce what you offer, so that your kids can learn to take care of their own financial needs and wants. Another consideration is what you expect your child to do with the money. You want to make sure that your child has enough to accomplish what you want him or her to do. If you expect your child to contribution to charity or your church congregation and set money aside for long-term goals, take that into account. My son’s allowance is large enough that he can give 10 per cent to our church congregation, and so that he can set 20 per cent of it aside for long-term savings. He still has money left over to spend on things he wants, such as books, video games, LEGO sets, and candy. Of course, there is a balance to be struck in these situations. You also want to instil the concept of saving up for items. For the most part, my son’s allowance is such that he can save up for between two and four months to buy most of the things he wants — after he’s set money aside for church and long-term savings. This is a reasonable amount of time for a boy who’s 11. He has to wait to buy some things, but he also doesn’t have to wait so long that he becomes discouraged. Finally, you also have to take into account your own financial situation. Sometimes the allowance you pay to your child is dictated by how much you can afford to pay, and not by other factors. You don’t want to end up in a situation where your finances are at risk because you are providing an allowance that is too big to each of your children. Be realistic about what makes sense for your family, and what makes sense for each of your children. 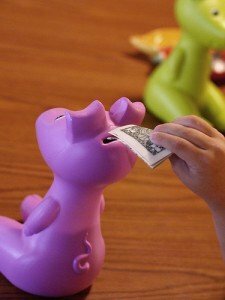 Paying an allowance is a big deal, and it is one of the best way to help your children learn about money, since they have their own income, and they can decide what to do with it.